A common misconception these days is that DIY is mainly pursued to fix or build things. What people forget is that there a few things you can do to improve upon an object or parts of your house, either for appearance or functionality purposes. If you have been following our Facebook page, you would have noticed that we at Black & Decker are on a mission to convert shoppers into what we like to call, DIY-ers. Stop buying and start making. That is our philosophy and this week we are going to show you how to glam up an old vase. Many of you will say that most vases are already decorative and very pleasing to look at. Well, if you have owned one you would know that after a few years the same design can get a little boring and it will soon defeat the very purpose it was bought for (To please your taste). Follow these steps and we guarantee a smile with a tilted head at the end of it. First, paint the entire vase with the black acrylic paint. Once it has dried, give it another coat. Leave it for a while until the vase is completely dry. 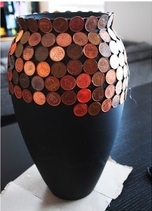 This next step requires you to get the coins out and stick them next to each other, moving all the way around the vase, like this. Once you have covered the entire area with coins, you need to let the glue dry. 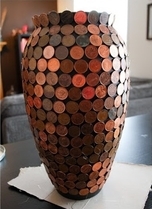 Once the glue is dry and you are sure that none of the coins will fall off, the next step is to find a spot to place this vase and fill it with flowers or potpourri. That was simple enough. For more great home improvement ideas, follow us on Facebook and bookmark this page. We will be back next week.